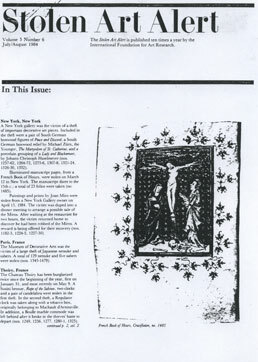 New York: Decorative art, manuscript pages, and Miró works stolen from New York galleries. Paris, France: 129 Japanese netsuke and sabers stolen from the Museum of Decorative Arts. Thoiry, France: Second burglary this year at Chateau Thoiry. Hamburg, West Germany: Mateo Goffriller cello. Copenhagen, Denmark: Gerhard Henning, The Princess and the Pea figure stolen from Royal Copenhagen Porcelain shop. Seven paintings from Norwegian National Gallery recovered in West Germany: Picasso’s Guitare et verre and Guitare, Rembrandt’s Study of a Head and Evening Landscape with a Horseman, Gauguin’s Mette Gauguin en robe de soir, Goya’s Procession X.9, and Van Gogh’s Self Portrait. Foujita painting, Woman and Child. Paintings: Col, Colman, Corot, van Gogh, Goya, Luny, Picasso, Rembrandt, Roux; silver: oblong casket, table mirror. Congress and International Exhibition of Physical Security, in August 1984.